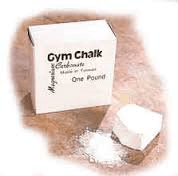 Gym Chalk is made from the same magnesium carbonate formula that rock climbers trust when their lives depend on a firm grip. So when it comes to dealing with sweaty palms in the weight room, you’re in good hands. Pun intended.